Sacroiliac relief can often be achieved using conservative methods of care, but in some cases may require more invasive therapeutic interventions. The specific nature of the pain syndrome will wholly dictate which measures must be taken to provide lasting relief. However, all types of pain require an accurate diagnosis in order to find the proper path towards a cure. How do you define relief? For some, this means finding a permanent cure for the pain and regaining full, unhampered functionality. For others, this means enjoying moderate reduction in pain, while simultaneously benefiting from markedly improved functionality. For some patients, relief might be considered any noticeable decrease in suffering, no matter how small. Therefore, in order to achieve the minimum level of relief you are ready to settle on, you must first define your goals and then discuss these objectives with your care provider to formulate a plan of action towards success. This resource section helps patient achieve their goals of pain relief from various sacroiliac diagnoses. If you are looking for a concrete plan of action towards finding relief, then this is the material you need to read before acting. Sacroiliac pain is known to be functionally-limiting and can become a very serious problem for any patient in a short time span. Virtually all causes of SI joint pain have the disposition to turn into chronic pain syndromes that can deteriorate the quality of life within a few weeks time if left undiagnosed and untreated. Statistics support the fact that the sooner an SI problem can be discovered, evaluated and resolved, the better the patient will fare. However, this is not to say that even long-term pain conditions can not respond very well to appropriate care, since they can. Finding effective relief from SIJ pain is not usually an intuitive process. In fact, some of the most effective methods of care are the ones that are rarely utilized by patients who lack professional healthcare guidance. Therefore, we tend to discourage self-care of SIJ problems, with the only exceptions being patients who have taken responsibility for professionally-designed exercise, knowledge therapy or coaching programs for maintenance care. Sacroiliac pain management practices can be constructive, neutral or destructive. It is always best to utilize constructive methods of care in order to maintain ideal general health. Sacroiliac coping strategies can assist patients in living with pain while they pursue curative modalities. Coaching for sacroiliac pain is perhaps the best coping strategy, as it provides pain relief that is as effective as drug therapies, without the risks. Offering free sacroiliac help is why we are here. The Cure Back Pain Network exists solely to help chronic pain sufferers with a wide range of diagnoses, including SIJ disorders. Holistic sacroiliac treatment focuses itself on treating the entire individual: mind, body and spirit. Natural sacroiliac treatment forsakes drugs and surgery in favor of organic therapeutic routines. Nonsurgical sacroiliac treatment is the rule of thumb for most diagnoses. Very few SI joint pain syndromes require surgical treatment. Alternative medicine for sacroiliac includes a diversity of practices that can be used to effectively reduce or even cure SIJ symptoms. Complementary medicine for sacroiliac works well in combination with traditional medical care techniques. Sacroiliac prescriptions vary based on diagnosis and the type of care provider offering the treatment advice. Sacroiliac cures can be achieved using many different types of treatment. SIJ concerns are unusual in the dorsalgia sector, since many can be completely cured using constructive and noninvasive care. Are you trying to fully recovering from sacroiliac pain? Be sure to check out our tips that can speed healing and get you on the path for full health sooner. Sacroiliac therapy modalities range greatly, so be certain to investigate all your options before making a choice on a particular plan of action. We are so proud to offer patients sacroiliac relief using a completely safe, effective and holistic pain relief program. You can get help right now from anywhere in the world. 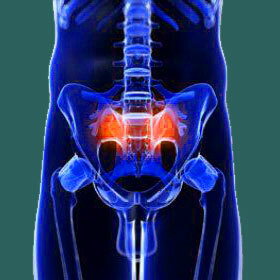 Conservative sacroiliac joint pain treatments and surgical interventions are both used for the majority of diagnoses. This means that there is usually a surgical fix and a nonsurgical fix available for each patient, so it is important to know the benefits and limitations of each treatment path. Finding relief might be challenging, especially if achieving an accurate diagnosis becomes problematic. It is vital to remember that most SI joint pain conditions that do not respond to indicated care are often misdiagnosed. To further your knowledge of the many different paths towards sacroiliac relief, we recommend familiarizing yourself with our sections covering sacroiliac treatment, sacroiliac surgery and sacroiliac products. Just exercise extreme caution when considering pain relief products for home-use, as these are certainly the least reliable sources of symptomatic respite.